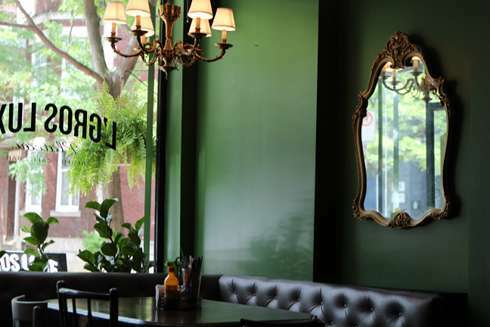 L’gros luxe has an impressive interior with a large bar on the side, windows up front offering an ample amount of light and a good seating capacity throughout the entire place. They have a décor that has that old style look and feel without sacrificing modern day technology. Food The menu is straight forward with a few items priced well under $7. Coffee is $2.50 but comes with free refills. 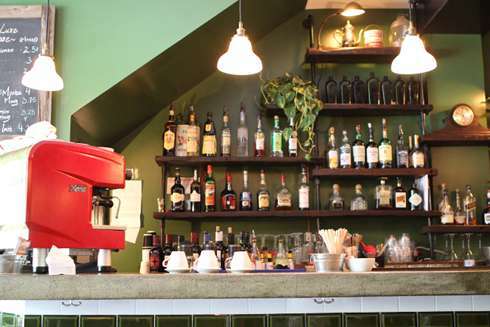 So, for a straightforward brunch and coffee you will pay under $10. Now, the dish size is not as large as other places but you can get a side at the low price of $2 and still come out cheaper than most places in Montreal and walk out with a full belly. They also have a wide assortment of bloody Caesars in the $8-$22 range. Sizes also range from a single to a double. Naturally, we started off with the bloody Caesars: the classic ($8) and the Mr Miyagi ($11). 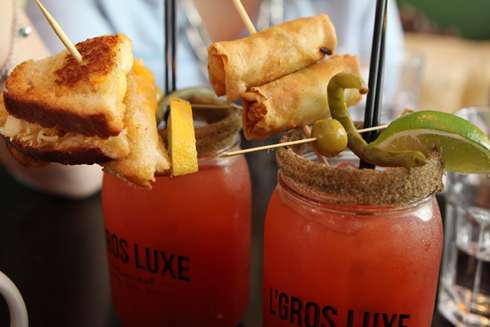 Bloody Caesars at L’gros luxe are quite impressive and they really get creative when it comes to the garnish. The classic had a mini grilled cheese topping and the Mr Miyagigi had an egg roll with sake fused inside. The drinks were different and fun which is a great way to start off your day. 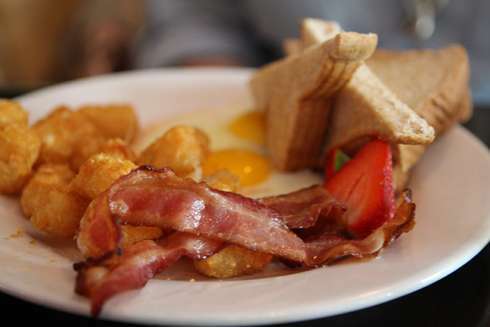 The classic eggs ($5) with extra bacon ($2) and extra avocado ($2) is two eggs, any style, with potatoes and bread. The price is ridiculously cheap and even if you splurge and get the two sides it is still less than what you would pay elsewhere. The dish itself is simple and it’s a staple breakfast dish with an old school price of under $10. Dollar per bite, you cannot beat this as you get something tasty and well priced. 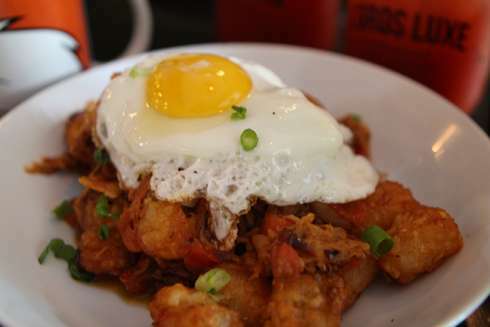 The pulled pork dish ($7) had pulled pork, egg, tomato, potatoes and onions. This dish was filling and tasty. It was fun and not too enormous yet you walked away full and satisfied. The pulled pork portion was generous and the price made us look twice. The dish does look small but it is surprisingly filling so you definitely get value. VegetarianThe menu is small but there are some safe vegetarian dishes, so you get choice. ServiceOur waitress was fun. We ended up chatting with her at the end and did not feel rushed to leave at all. Wrap up Bang for buck, you cannot go wrong with Gros Luxe. And, even at these cheap prices, the food doesn’t get compromised. The various types of bloody Caesars make brunch fun and doesn’t break the bank while doing it. 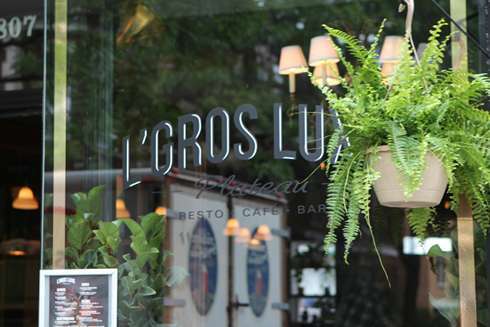 I love L’Gros Luxe but I’ve never been for brunch! Yuum!